Pinot on the River The 2016 Pinot on the River will be held on the Plaza in Healdsburg on Sunday, October 23. The event now attracts 1,000+ people and hosts 100 wineries and artisan food producers. Profits benefit the Boys & Girls Clubs of Central Sonoma County. Tickets ($75 in advance) are 100% tax deductible (excluding fees). Visit www.pinotfestival.com for a list of participating Pinot Noir focused wineries. Harvest on the Coast With its wineries located just five miles from the ocean on average, it is fitting that San Luis Obispo Wine County holds its signature harvest season event right next to the Pacific. On November 5, 2016, local wineries and chefs will converge at Avila Beach Resort for the Grand Tasting & Wine Auction as part of the larger Harvest on the Coast weekend celebration. For details on all the events of the weekend, visit www.slowine.com/events/harvest-celebration.php. Sonoma County Vintners New Website Sonoma County Vintners (SCV) has launched their newly designed website, www.SonomaWine.com. There are dedicated sections for consumers and members as well as an extensive trade section featuring wine facts, detailed appellation information, industry reports and information about SCV programs. A new Harvest 2016 section has been added as well that includes vintner Q&A’s, as well as harvest reports and a video series highlighting what’s happening in the vineyards. 2017 Pinot Noir NZ This celebration of New Zealand Pinot Noir is held every four years for three days in tasting venues along the Wellington City waterfront. The dates are January 31-February 2, 2017. The International Pinot Noir Tasting will be led by Jancis Robinson OBE MW, Mike Bennie, and Kenichi Ohashi MW. Visit www.pinotnz.co.nz to view the preliminary program and register. Vineyard Adventures Program Sonoma County Winegrowers announced this month the launch of an expanded Sonoma County Vineyard Adventures, a program designed to help wine lovers get an insider’s view of Sonoma County’s sustainable vineyards. Vineyard Adventures are free self-guided vineyard walks that provide Sonoma County visitors with an interactive and educational experience at seven of the region’s wineries including Amista Vineyards, Balletto Vineyards, Francis Ford Coppola Winery, Matanzas Creek Winery, Paradise Ridge Winery, Schug Carneros Estate Winery and St. Francis Winery & Vineyards. Two new walks will be available in the fall: Mauritson Wines and La Crema. For more information, visit www.sonomavineyardadventures.com. McEvoy Ranch Fall 2016 Tours The 550-acre sustainably farmed McEvoy Ranch in Marin County just west of Petaluma will be hosting tours of the Ranch including olive groves and vineyards along with olive oil and wine tasting. McEvoy Ranch is one of the largest U.S. producers of estate grown, certified organic extra virgin olive oil. Advanced reservations are required and ticket prices are a reasonable $35 (wine tasting is $15 additional). Reservations can be made at www.mcevoyranch.com. Bill Nanson Leads Private Burgundy Tours Bill Nanson is the well-respected Burgundy wine author (Burgundy Report) who offers guided tours during the whole year and for any day of the week. The format is individualized to fit specific requests are simply left to the discretion of Bill. All tours include a pickup and return to your hotel in the Côte d'Or or Chablis. For more information, visit www.burgundy-report.com. Importance of Drinking Pattern on Health Effects of Wine A review article appeared in Food & Function, a publication of the Royal Society of Chemistry in the United Kingdom and was reviewed by the International Scientific Forum on Alcohol Research. 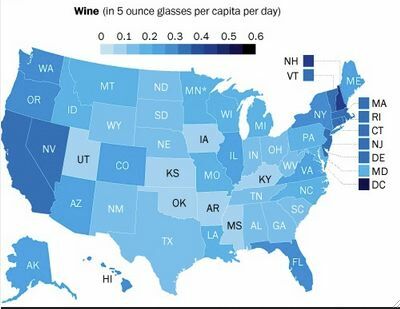 The report presented a summary of evidence-based scientific data relating the moderate consumption of wine and other alcoholic beverages to health. The article summarizes the key differences in health effects when alcohol (especially wine) is consumed moderately, with food, and on a regular basis rather than in binges. These differences emphasize why evaluating only the total amount of alcohol consumed, and not how it is consumed, is inadequate when studying alcohol's effects on health and disease. Wine Scores & Reviews Reflect the Reviewer I believe that wine reviewers approach the qualitative assessment of wine differently depending on their occupation or consumer status. In other words, their palate is tuned differently. Winemakers tend to look critically at flaws in wines and how to fix them. Wine merchants are interested in typicality. Sommeliers look more at a wine’s suitability as a food match. Wine critics focus on quality. Consumers pass judgment simply based on whether they like the wine or not. Discerning consumers often assess a wine more critically.